Cleaning the pilot light system on your gas stove is important for safety as well as efficient operation. Although the pilot assembly is both simple and highly effective, its disruption can lead to difficulties in lighting the stove. In extreme cases, it can also lead to dangerous natural gas leaks. Periodic cleaning of the assembly will not only help your gas range last longer, it will ensure its safety and reliability. 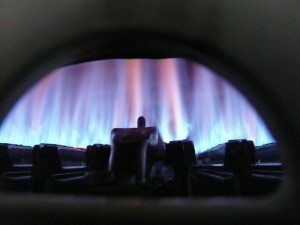 A natural gas pilot light is a tiny flame that burns continuously for the purpose of igniting the burners of your stove. These pilots operate without the need for electricity, allowing you to use the stove during power outages. Depending on your range, you may have a single pilot flame feeding all the burners, or you may have two separate pilots. When you turn the knob to light a burner, gas flows up through a perforated tube, known as the flash tube, into an ignitor (responsible for the clicking sound a burner makes before lighting), lighting the gas at the burner. Voila, you can now heat your water or cook your soup. As simple and efficient as this system is, it can easily become dirty or clogged. Food particles and grease drip into the burners during use, becoming trapped in the perforations of the flash tubes and ignitor. Dirt and dust sticks to the greasy buildup and, over time, can clog all or part of the system components. Burners take longer to light, requiring more and more clicks of the ignitor. Eventually, the burner simply won’t light at all. Because this happens gradually, you may not even notice this increasing difficulty. In most cases, the problem will be more pronounced at the burners you use the most. Unplug the electrical cord to the range, if it has one, and lift the top to provide clear access to pilot assemblies. Turn the stove’s gas valve to off and allow the pilot assemblies to cool completely. Use a soft brush (an old toothbrush works well) to gently remove the debris from ignitors, flash tubes and pilot orifice itself. Gently insert a thin wire or sewing needle into the pilot orifice, the holes in the ignitors and flash tubes as well as the burners themselves, agitating it slightly to dislodge debris. Use canned air to remove any remaining bits. Be sure to clean up any dislodged particles that have fallen below the burners. Turn the gas back on and re-light the pilots, monitoring them for several minutes to be sure everything is working correctly. Test each burner for proper operation before closing the top. Some newer model gas ranges no longer use a pilot system, using an electronic ignition instead. These systems are typically sealed, requiring professional service and repair. Natural gas can be dangerous to work with, posing risks of combustion and inhalation. 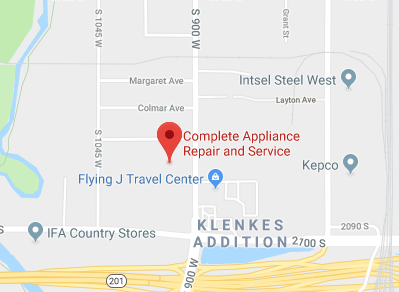 In the Salt Lake City area, Complete Appliance Repair specializes in appliance service, repair, maintenance and installation. Contact them today for professional maintenance on your gas range, including cleaning the pilot light and checking for other potential problems. This entry was posted in Blog and tagged Kitchen Repair, Stove maintenance, Stove Repair on March 4, 2015 by admin.